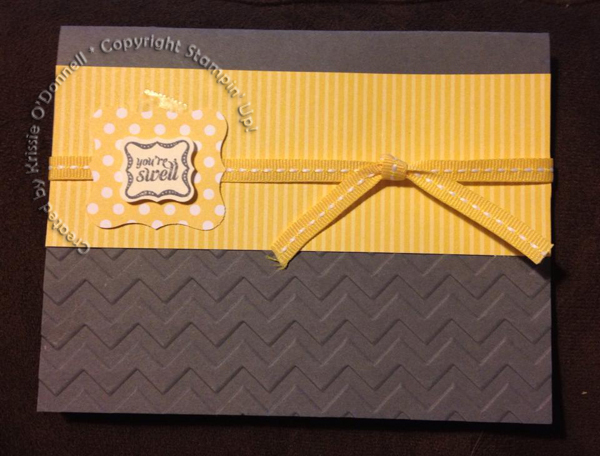 I’ve really enjoyed the yellow and gray trend, as much as I’ve liked the Chevron trend. So I joined them together. It wasn’t too unrealistic as our convention bag from last summer was made up of yellow chevrons. I even bought a dress to match it! So the itty bitty cute curly label is new! Its free in our Sale-a-Bration brochure, and it will carry over into the catalog after SAB is over. It has a free set that matches called Pretty Petites, but it also has another set to match called Ciao, Baby! Which is where this image comes from. That set also has cute little images for our newest and smallest scallop circle punch. I love all these little versions since it makes it fun to layer!